Michael Mann has gotten a lot of mileage over the years out of telling flashy stories about bad people, whether it’s the fictional crooks who populate projects like Thief or Heat, or real world criminals like the subjects of his 2009 period piece Public Enemies. It’s not wholly surprising, then, to learn that Mann occasionally keeps tabs on rising stars and established players in the real-life criminal world, with an eye toward someday telling their stories. Hence a Deadline piece that ran today, detailing Mann’s plans to purchase the book, TV, and film rights to a new non-fiction tome written by journalist Elaine Shannon, centered on a one-time online pharmaceutical distributor-turned-international gun smuggler and admitted multiple murderer named Paul Le Roux. Shannon—who also wrote Desperados, which Mann adapted into an Emmy-winning TV miniseries, Drug Wars, in 1990—has spent four years assembling her portrait of Le Roux, who seems like a pretty firm candidate for Mann’s next cinematic criminal. So, who is Paul Le Roux? The earlier details of his life are somewhat fuzzy, but he began appearing on Usenet message boards in the mid-’90s, quickly becoming a leading voice in the world of encryption software. From there, he founded one of the internet’s first grey-market pharmacies, RX Limited, supplying net-savvy American customers with all the Viagra, propecia, and painkillers they could eat. 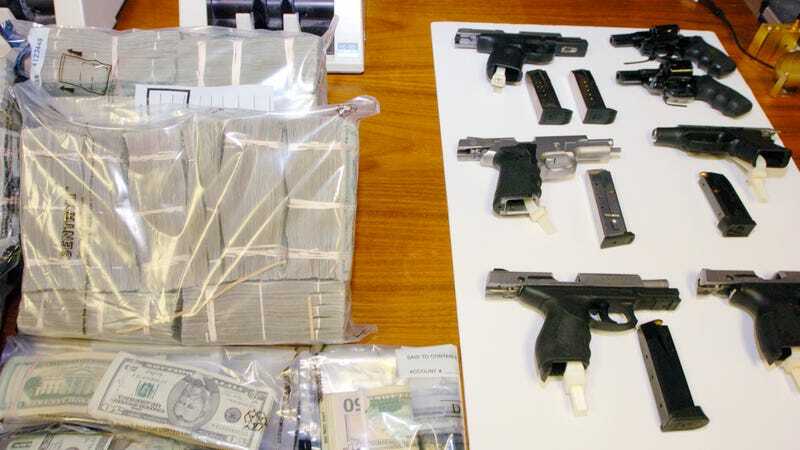 After government regulations started cutting into his profits, Le Roux seems to have realized that the real money was in trafficking products that were illegal already, and began moving his way into the bloody world of weapons, drugs, and other forms of smuggling, supplying missile technology to Iran, smuggling amphetamines out of North Korea, and even allegedly arming his own private military force in Somalia. He also orchestrated a number of murders, mostly of employees he thought were cheating him in some way. The most fascinating thing about Le Roux, though, is the fact that most of this stuff comes from the man himself: Arrested in 2012 on charges of conspiracy to import narcotics and violating the Food, Drug, and Cosmetics act, Le Roux signed a deal with the U.S. government on his second day in custody, granting him immunity for any other crimes he might have committed. He then immediately turned around and admitted to at least seven murders, which must have been a little galling for everyone involved. Meanwhile, he began helping the DEA dismantle his own organization; with his arrest kept secret, Le Roux continued to send instructions to many of his top employees, including his personal hitman and lieutenant, leading them directly into government traps. There’s no guarantee that Mann will ever actually bring Le Roux’s story to the screen—dude’s 75, so there are only so many high-tension crime thrillers presumably left in him—but he noted today that he’s been keeping an eye on the career criminal for some time. “Elaine Shannon’s book,” Mann said today, “Took me into the actual people and places, the language and attitudes as powerfully as great fiction. Deeply and vividly, it illuminates the mind of Le Roux and the dark frontier of transnational crime.” Sounds like a cheerful, family-friendly hit to us!